Getting there: Reach Panvel, catch a bus to Maldunga and alight at dhodhni bus stop, walk to dhodhni village. Difficulty Level: Beginner. This is a very short trek that can be done by First Timers with ease. Fitness required: Basic Fitness, say if u can easily climb 6 - 7 floors at one go then Matheran should be fairly easy for you. Other general health precautions applicable for any physical activity applicable. Fear factor: There are no steep slopes to be scared about. The slopes in this route are simple rolling gradients with no sheer vertical cliffs. All in all a perfect beginner's level trek. Things to carry: 2 L of water would suffice. Since the trek takes only about 2 hours, lunch can be had at matheran. You may consider carrying chocolates and/or ORS as well for energy and refreshment. Panvel is fairly well connected with numerous options in both Bus and local train to get there from Mumbai and/or Pune. It’s always preferable to start your trek as early as possible to avoid the wrath of the sun and get to the destination quicker before sunset for longer treks. We reached Panvel by 7:30 and chose to catch the connecting bus to ‘Dhodhni’ at 7:50. Any Bus to Maldunga goes via ‘Dhodhni’ Village and the first one is at 6:30 AM. The travel time is around 30 mins. You may also consider using your personal vehicle to reach ‘Dhodhni’. Dhodhni bus ride presented some breaktaking scenery of large village fields, bordered by tall green covered mountains rising into the ready to rain clouds. There were light showers all the way through the ride and we saw the Gadeshwar dam just as we reached the Village. 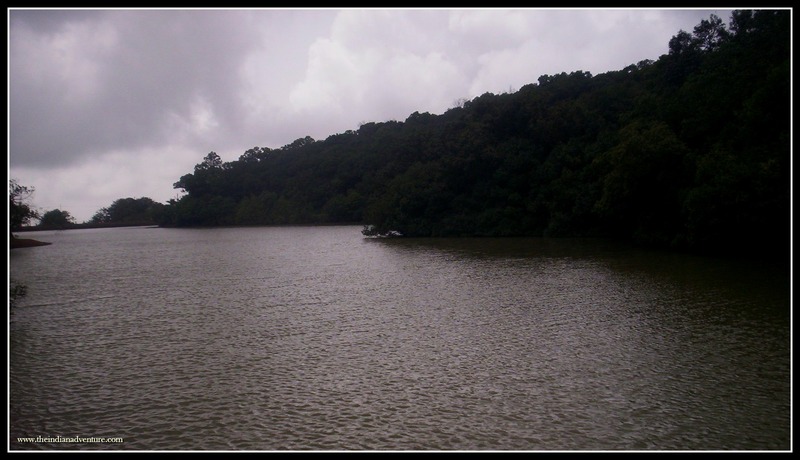 The base of the Matheran trek is about a 2 Km pleasant walk from the bus stand. In monsoons the area is incredibly green with plain flat fields merging with slopes, rising away into green mountains, each wrapped in silver ribbons of waterfalls all across. The direction of the waterfalls swayed with the wind, the water flow from the falls were not thick, but fine misty sprays, deflected and redirected every now and then, as if the mountain had a mouth and were blowing on them !!! The matheran trek trail starts from midst a tiny village and slowly rose to a steep mud path hewn into the grassy mountain and continuing in a zig-zag pattern into some unseen distance. The trail rises for some time and then suddenly opens onto a flat grassy area in the middle of the mountain. It’s a good place to take a short break and refresh the heels and the body and we did exactly that. Once we were ready, we continued to move across the clear but steadily rocky and rising path. The path abounds in flora and fauna. We keep hearing birds which sang as if a human was whistling, then monkeys playing around, snakes resting in the sun and a lot of wild fruits and berries lying ripe along the path, but we never tried to eat those fruits since we didn’t know if they were edible. We moved on until we heard a progressively increasing gurgle of water. The path suddenly opened into a rocky area which was being washed continuously by a not so thick, yet a very long waterfall. We were now in the middle of the hill and the waterfall seemed to come from somewhere out of our line of sight and drop into a depth again out of our line of sight. The water was refreshing and cool and freshened us up. A little after the waterfall the grade increased and we faced a deep cliff to our right a lot of times, treading carefully in narrow ledges and sometimes on moss-covered rocks. 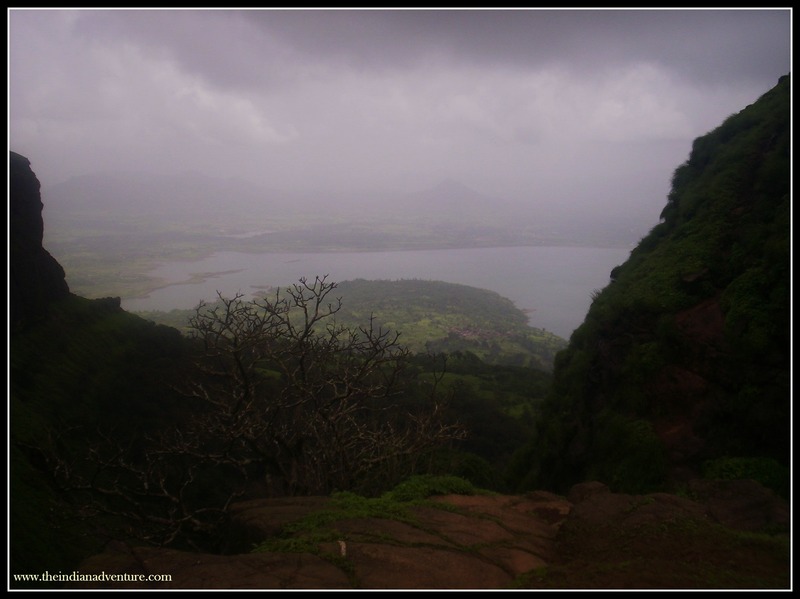 Except for occasional stops to enjoy the beauty of the surrounding and catch some breadth we progressed continuously and made to the open pasture of sunset point on the northern end of matheran in about a hour and half. we had made it up 850 metres or 2833 feet of vertical distance. the wonderful vista looking down below to the point from where we started our ascent combined with a sense of achievement was a really special feeling indeed. We were standing at sunset point on the outskirts of downtown matheran. We continued on our way towards the main town of Matheran along the muddy path. On the way we came across a mountain face which was a sheer drop and down the middle of this drop was a thin wind-swept waterfall the bottom of which was not visible due to thick greens shrubs and trees. We came across a point where the path forks into 5 more places and headed towards the one which made way to the main town market bazaar peth. As soon as we approached the area we saw a sizable weekend holidaying crowd holidaying that reached using the traditional ways. Inside the Matheran town, cobblestone pathways replaced the mud roads. The most striking thing about Matheran is that the motor vehicles are not allowed and have to be parked about 4Km from the town in a paid parking. You may expect your car to be dustily unrecognizable when you go back. For those who do not or cannot walk the distance, horseback or tunga ride options are available. Toy train is another popular way to get to Matheran. Toy Train to Matheran is an enjoyable way to get to Matheran. There are two Toy Trains – One from Neral and another one from Aman Lodge. There are 5 trains that ply the Neral – Matheran route. It is a beautiful journey that hugs the many hair pin bends in the hill and provides a much better scene than the shorter, quicker and cheaper road route. Two main drawbacks are that no advance booking is available and people often spend several hours waiting in the queue to get tickets, the other one is that the train services are suspended during Monsoon which is the best season to go to Matheran. Trains from Aman Lodge cover the 4 Kms where vehicles are not allowed and can be reasonably crowded as well during the weekends. We enquired about alternate routes that descended down to take us to some railway town, and was pointed to One hill Tree point about 2 Km away and in opposite direction of the sunset point where we had ascended. We walked along the way and met a woman who was taking some cargo down to the base of the mountain. The women went descending the one tree hill point. We took some breathtaking pictures of the scenery around one tree hill. A huge lake created by the reservoir of morba dam lay expansively below and there were mountains with sheer cliffs everywhere. One tree hill point trekking path was surely not for the faint-hearted !!! and the woman whom we saw while reaching here was definitely not faint-hearted either. She went midway through the precipice and realized she had forgotten something on the top. So she clambered back up and hauled back whatever she was looking for and sauntered back downstairs with a basket on her head and slippers below her feet. She said she does this sort of daredevilry every weekend!!! We reached Charlotte lake almost by mistake and ventured around the area like any other tourist. We found a small secluded area with a pumphouse, ventured there to find a stunning cliff riddled with waterfalls. We were standing on the top of a waterfall released here by the dam that bordered the charlotte lake. A lot of rain meant that the dam vents were opened and a lot of waterfalls were allowed to escape into the deep void a kilometer beneath us. There was a really enormous waterfall and a little waterfall which no one seemed to visit. The little waterfall’s moisture was swirling around in the wind. To see how water droplets behave in the really gusty wind, we threw some of our leftover drinking water into the void, and some of it actually came swirling back upwards to hit our faces. It was magical. We went on to stand on the top of the massive waterfall with its deafening roar. The striking feature was the wind and the heavy swirling moisture everywhere. But it was too marshy here and our shoes turned a really filthy earthy brown and they started slipping and sliding under us. When our eyes had their fill of the magnificent vista, we trekked on another kilometer to the echo point. The sun was beginning to set behind us, and we started back towards the market place. We walked back on the road route to Neral, which was a little hard on our knees due to the steep incline. From Neral local trains to Mumbai are available in plenty. Back home after a wonderful trek, with a little leg pain, loads of memories and raring to hit the trail once again for an adventure. 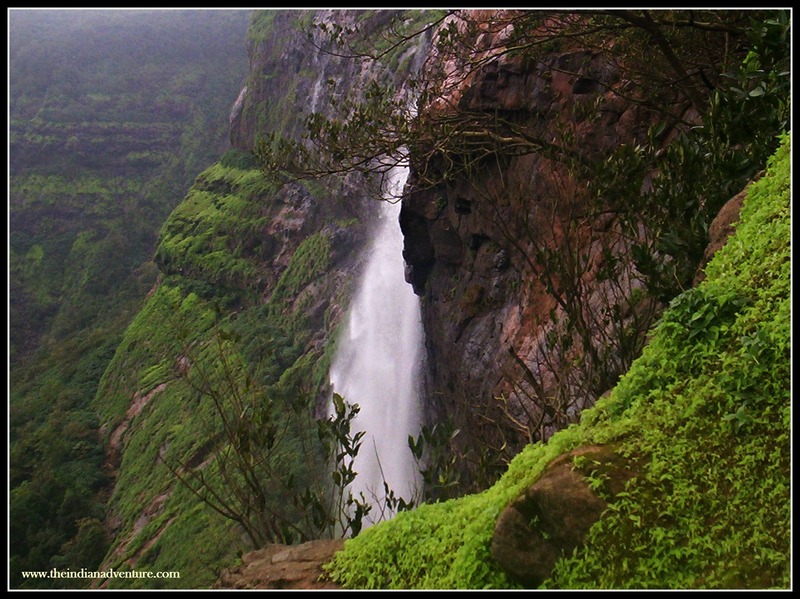 Best time to trek is the monsoon with moisture in the air and waterfalls everywhere. Second Best is the winter time. Neral – Matheran train is a beautiful journey. But avoid weekend to avoid the crowds. Matheran is the closest hill station from Mumbai, so you can expect a reasonable amount of crowd at all times. Be Prepared with Waterproof equipments and covers to protect your equipment and yourself. If it doesn’t rain and you are wearing a rain coat, it can get really stuffy and dripping sweaty. If it rains and you are not wearing you can get dripping wet. So be ready to get drenched anyway.